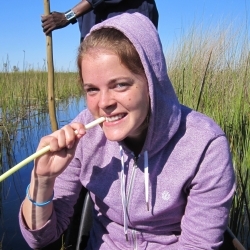 I chose the University of Botswana for my exchange because I had previously spent time in Southern Africa and briefly visited Botswana during my travels. I was interested to go back to the area and saw a university exchange as a good way to meet locals and learn about their culture. I also knew Botswana to be peaceful and that I would be safe and comfortable there. 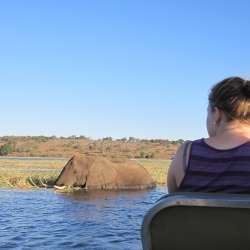 Botswana also has some incredible wildlife and national parks, including the Kalahari Desert and the Okavango Delta, which appealed to the nature lover in me! Finally, the University of Botswana offered a diversity of courses in Environmental Science which allowed me to meet my program requirements at UBC and graduate on time even with going on exchange. I am interested in policy development as well as understanding how to mobilize people towards taking action to address social and environmental issues including climate change. The highlight of my international experience was the friends that I made. Being in a university setting allowed me to meet a variety of people from different backgrounds in Botswana, through these relationships I was better able to understand the lifestyle of people whom are generally misrepresented in western culture. Friends who I made in classes, residence and as part of the Rotaract club gave me the opportunity to visit their homes and families. I also had an amazing experience travelling both during my semester and afterwards for a month. I travelled throughout Botswana and South Africa as well as numerous other countries in Southern and Eastern Africa. Through travelling I was exposed to a diversity of cultures and climates. I am interested in policy development as well as understanding how to mobilize people towards taking action to address social and environmental issues including climate change. I am not sure exactly where those interests will lead me. After graduation, I plan to look for a job that will allow me to explore them further. I also plan on returning to university in the future to complete a Masters degree.